The textile industry expanded greatly in size and range of performance during the 19th century. Sewing machines were introduced in both domestic and industrial contexts. Clothing could now be mass produced and sold in standard sizes, reducing the expense to both manufacturers and the public. 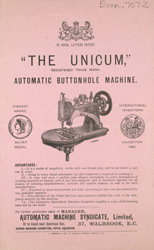 Equipment like this automatic button hole machine were very popular because they saved time and labour.